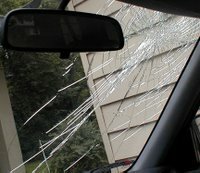 Yesterday, as we were driving home from the science museum, something smashed into our car and totalled our windshield. As you can see in the pictures the whole passenger side is pretty smashed up. Glass bits/shards/dust flew everywhere, including the tiniest bit into my right eye. It all happened so fast that I didn't see what hit us. It was crazy! The girls both started freaking out. The crying was instantaneous. And I was caught completely offguard-- adrenaline pumping, rubbing my eye reflexively, and looking for a spot to pull over. It took me a minute to figure out what had happened, at least, to note that indeed the reason I couldn't see out of the windshield was that it was smashed, rather than what I immediately presumed-- that a large bird had dropped a tremendous amount of feces on our window. Or someone tossed a large boulder from a second-story window. As I partly pulled over to the side the shrieking in the backseat only got louder and more frantic. Kitty Bill joined in and I couldn't see or think straight. I couldn't even see well enough to pull off the road. I took half a look at my screaming kids and just kept driving. This is how hit and runs happen, I thought later. By folks so shaken up by a sudden impact and overwhelmed with a backseat full of shrieking kids that they can't think straight until two hours later.... when they return to the scene of the crash, and find nothing. Which is exactly what we did. I parked the kids at the dining room table and spooned food into their mouths to stifle the noise. I clutched Kitty Bill to my breast, rubbed my eye, and tried to figure it out. Luckily for me, I had Agatha Sunburst on the scene. "Kitty Bill did it," she announced with great certainty. "I saw him do it." Now how does a baby, sitting in the back seat in a rear-facing carseat, shatter the windshield of a moving car? Apparently with his favorite toy. Allegedly, Sunburst claims she saw him huck it backwards, up and over his carseat, with tremendous force, where upon it IMPACTED the windshield, and... get this... rebounded back into his chair. Like a boomerang. Tremendous force. Talent, even. Forget Kitty Bill, we should call him Baby Hulk. A pitch pipe. Think harmonica-like. Now, Sunburst almost had me with this one. It was the sincerity of her voice and the serious look on her face. She SAW it. Kitty Bill. In the Car. With a Pitch Pipe. But then I thought about it. If I had chucked it, would that break the window? It's metal. But small. How hard would I have to chuck it? Pretty hard. Over my head? Backwards? On a good day, maybe.... but I'm no Hulk. Then we examined the windshield. Apparently you can tell whether the impact was on the outside or inside from the kind of damage present. Is there glass missing on one side? Does it bubble inward or outward? Is there debris? That's when I saw it. Little, stiff, fawn-colored hairs embedded in the glass on the outside of the windshield. Definitely an outside job. But what the heck did I hit? I was driving 25 mph on a residential street. There are trees, but none were overhanging at this particular stretch. The entire right-hand side of the street was loaded with parked cars. So if it was indeed a squirrel-- the hair color is right... where did it come from? 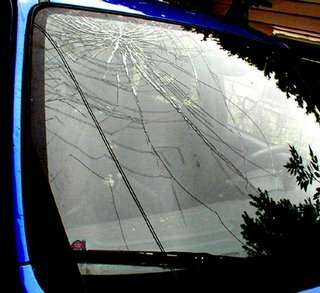 And could a squirrel do this to a windshield? Really? I was only going 25 mph, it wasn't like I was speeding down the freeway. Wouldn't there need to be a lot more force involved? Newton's Third Law of Motion. "For every action there is an equal and opposite reaction." I knew I should have taken physics in high school. So if a bug hits my windshield, both the bug and the car are exerting the same amount of force. By law. The bug splatters because it can't withstand the force... Now, whatever I hit yesterday SMASHED my windshield. 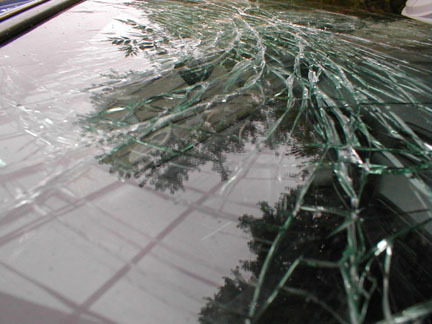 So if my windshield looked like that... that same force exerted on a squirrel ought to have killed it. Don't you think? Itty bitty little thing like a squirrel. Smashola. What has the same fawn-colored fur as a squirrel but can be chucked out of a two-story window? A coconut? Think about it.... SMASH! Yep. A coconut could do some damage. But wouldn't it splatter stuff all over my windshield, too? Coconut milk, meat, shell debris? I loaded the kids back into the car and drove back to the scene of the crime to look for bodies. Nothing. No roadkill. No coconuts. No boulders, birds, tree limbs, or people. Nothing. A squirrel with a coconut head dropped out of a black hole in the space-time continuum and smashed into my car and then vanished. Into thin air. Not some coconut-grafted flying squirrel... maybe Time bandits. But it's okay. I called them. Just to make sure I didn't hit anyone or anyone didn't hit me. Just to be sure that if someone was chucking coconuts or lead-filled squirrels out of two-story windows in the University area that there was some sort of record somewhere. That the powers that be know about it. The very nice officer that came out stood at my windshield and shined his flashlight on it for a very long time. He took a few notes and looked at the windshield some more. Clueless. Definitely an outside job, but clueless. I showed him the hairs. Aha! Evidence. "A cat?" He pondered, and then shook his head. "A coconut-headed cat," I suggested, and let him in on my crazy squirrel dropping out of the sky theory. "Are you sure you didn't hit a deer?" Deers, squirrels, coconuts and Time bandits... all falling from the sky. Yeah, uh huh. maybe... you don't think... could it be?